Work life balance has been a bit of a problem this year. I've got two young kids at home, a desire to play golf, a passion to pour myself into my new school and did I mention my kids who are almost 3 and 14 weeks old. The notion of giving up a Saturday for professional development at the moment, while attractive, isn't the easiest decision. What F2F connections would I make? What would be my takeaways for the day? What could I offer to the others that were there on the day? Last year my first educamp had been quite an eye opener and I anticipated lots of PD goodness this time around. First of all it was awesome to meet Stuart Kelly @stuartkellynz (nice blog post Stuart), Myles Webb @NZWaikato and Amanda Signal @Heymilly. I have different connections to each of them, so it was great to meet them. I caught up with many others that I'd met before, whether fleeting or not so fleeting it is always beneficial having face to face time. Along with others, I find the connection made through Twitter is advantageous but there is nothing like the relationships and connections that are formed through real conversations rather than just 140 character snippets. How might Play-based learning fit with the needs for LC4? How might provocations be used effectively in LC4? Thanks for the idea of Grand or Petit provocations Caroline. How would our wider school community feel about Play-based learning, especially if this was within LC4 (Year 4-6). Did the #ScientistForADay inquiry have components of Play-based learning? I think it might of, I now need to reflect on whether this was successful using another lens as opposed to the original aims that Lisa and I had at the time. I'm quite curious as to where our discussions at HPPS could take us, stay tuned I know this will lead to a blog post or two. I didn't even know what this was prior to the start of the day, but seeing Justine Driver talk about her love of the Viewmaster as a child I knew I was in the right place. For a concise description, place your phone inside a cardboard box with some lenses to watch an app, then let the Virtual Reality App do the business! Check out Google Cardboard for a better description. Totally cool and as a toy I want one! From an educator's perspective these are also very exciting. Before the end of the session I had 4 ideas running through my brain. 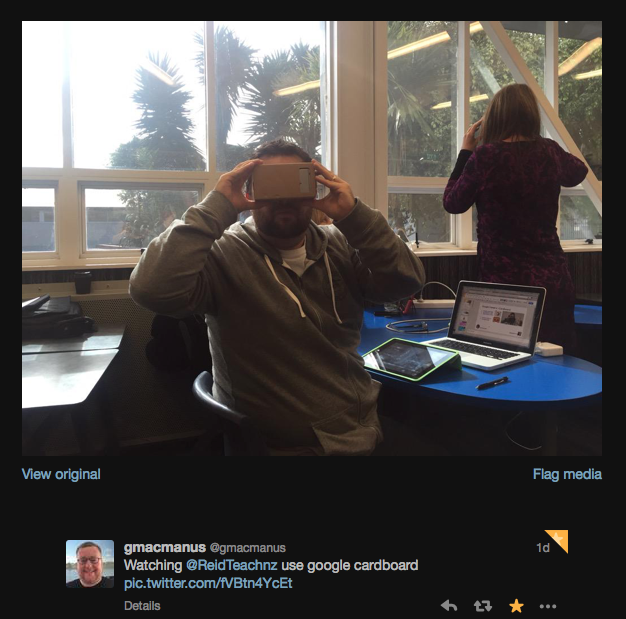 Firstly, as a simple writing prompt Google Cardboard could be exciting. We know that children may engage with activities simply because of the addition of digital technology. VR apps that could have a child experiencing another city, a tourism attraction or any such thing really opens up writing opportunities. Second (and third), the Hobsonville Point area and even our school are rather new. We could take photos, upload them and then allow others to experience the growth of our area and school through Google Cardboard. This has direct ties to an ongoing project at HPPS and HPSS, opportunities for some authentic collaborative projects here are massive. The last opportunity, all credit here to @Gmacmanus (pictured). I've been taking part in an interesting little project to assist @NZWaikato and his class as they try collect information on classes so they can recreate them in Minecraft. His learners and mine are operating in quite different classroom environments, Google Classroom would provide a more realistic way to experience each others classrooms. This was a very cool takeaway for the day, now I have to order me some Cardboard but I think I'd like to get an old fashioned viewmaster too. 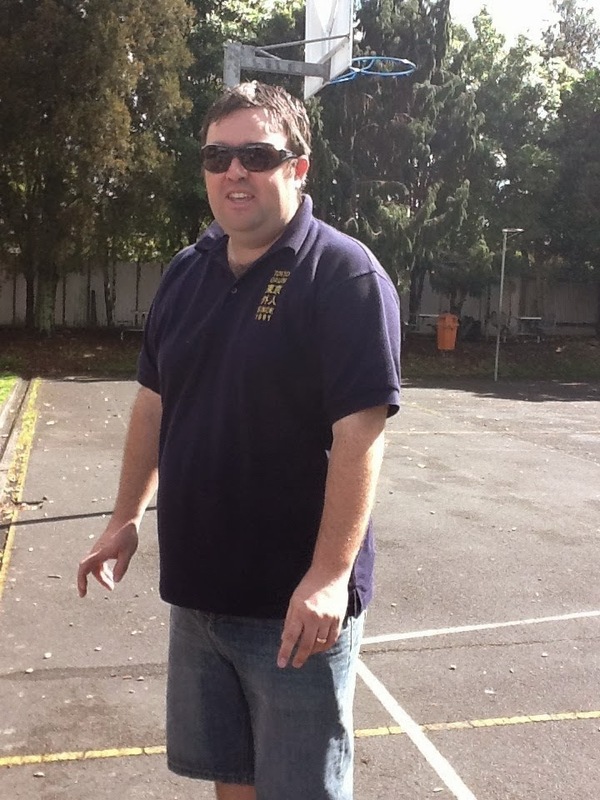 I took part in the smackdown by talking about one of my favourite subjects Kidsedchatnz. My involvement in this is limited to being an advocate these days, but advocate I did. 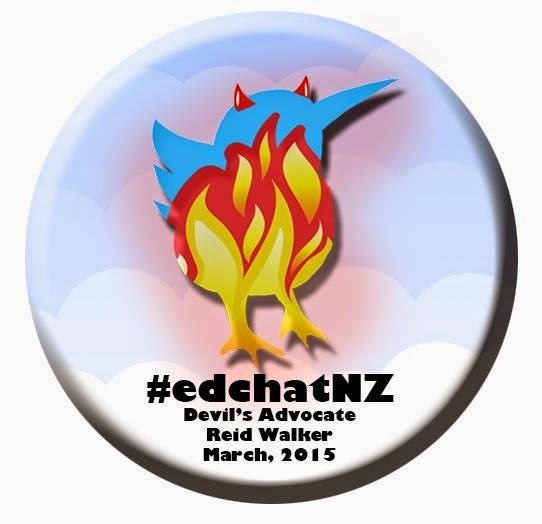 I also posted a slide for #Edchatnz and all of the other education chats on Twitter. I'm glad I did this as it led to a small session where myself and @jacquea provided support for others new to twitter, chat sessions and tweetdeck. During this session I also chatted with Michelle Simms who is about to begin a chat session for librarians as the moderator. I know that many of us have now moderated chat sessions and I thought that I might have even seen the odd blog post or two on this, searching for posts online gets you many responses. Perhaps we need to crowd source a Moderators Guide for our Kiwi educators. 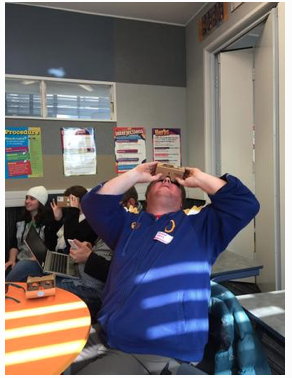 Once again, #educampakl has proven to be useful PD. The unconference style really lends itself to be whatever you need it to be, for me the connections, takeaways and ability to give back make for a powerful day. But more teachers ought to engage with educamps as they are so much more invigorating than the one size fits all approach that other PD courses tend to be. Futhermore, if you were struggling to get your school to come to the party with some PD need that you have, you'll more than likely find that need met at an Educamp, or at the very least someone who could answer your questions or point you in the right direction.